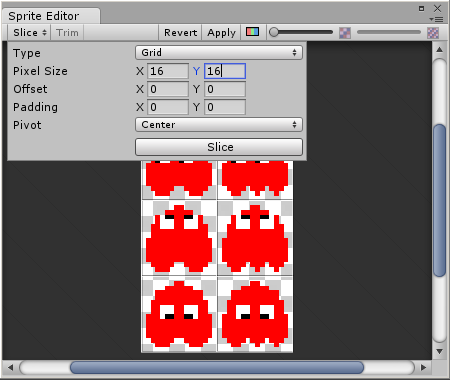 In this Tutorial we will make a Pac-Man clone with only 62 lines of code by using Unity's powerful 2D features. 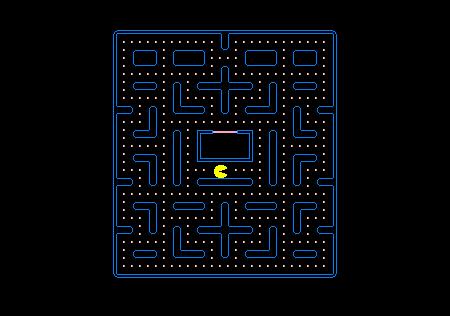 We will keep things as simple as possible and focus on the maze, the ghosts, the food and of course Pac-Man. Feel free to read our easier Unity Tutorials like Unity 2D Pong Game to get a feeling for the engine first. 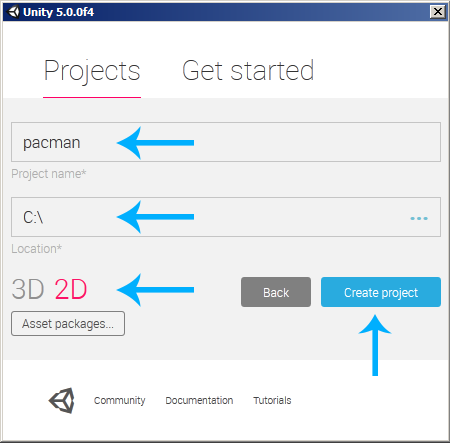 Our Pac-Man Tutorial will be developed with Unity 5.0.0f4. Newer versions should work fine as well, older versions may or may not work. The free version of Unity 5 now comes with all the engine features, which makes it the recommended version. Note: a Pixels Per Unit value of 8 means that 8 x 8 pixels will fit into one unit in the game world. We will use this value for all our textures. 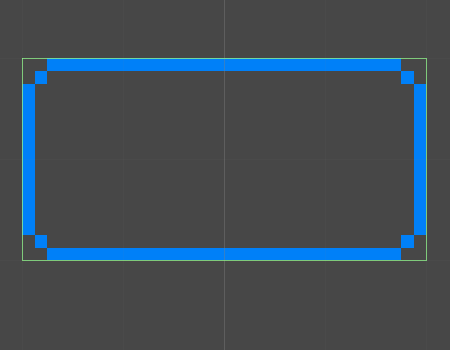 We selected the value 8 because the distance between two Pac-Dots (the food) is always 8 px and we want that distance to be 1 Unit in our game. We selected Bottom-Left for the Pivot because it makes the alignment easier later on. Right now the maze is only an image, nothing more. It's not part of the physics world, things won't collide with it and Pac-Man could walk right through the walls. 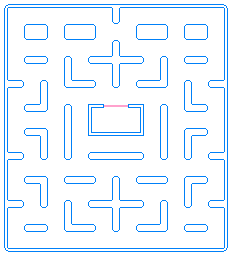 Let's change that by adding a Collider for each wall in the maze. What we really want is to have a Collider around each wall of the maze. There are two ways to do this. We could either create an algorithm that reads the maze image and generates Colliders based on it, or we could just keep it simple and add all the Colliders manually. 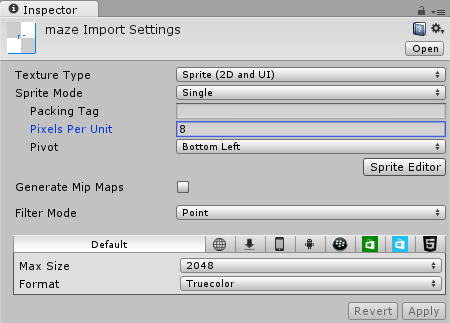 Note: this button is new in Unity 4.6, so make sure to use the latest version if you don't see a button there. We will repeat this process for every wall in our maze. 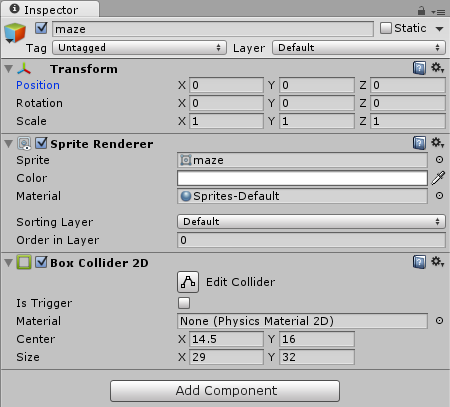 All we have to do is select Add Component->Physics 2D->Box Collider 2D, press the Edit Collider button and then modify it in the Scene until it fits the next wall. 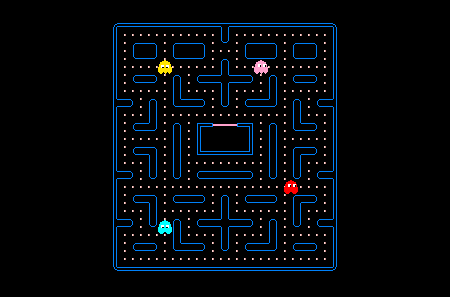 Note: if later on your Pac-Man get's stuck in the maze or has trouble moving, then it's because the Maze Colliders are not perfectly exact. 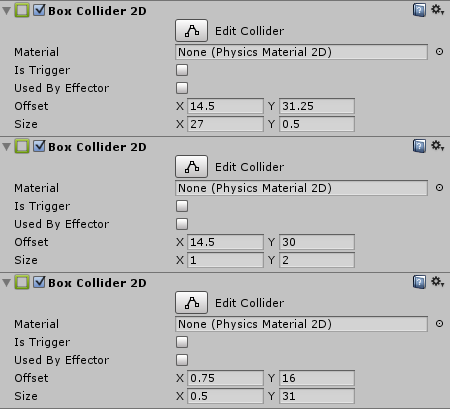 Note: adjusting all the Colliders may take a few minutes of time. 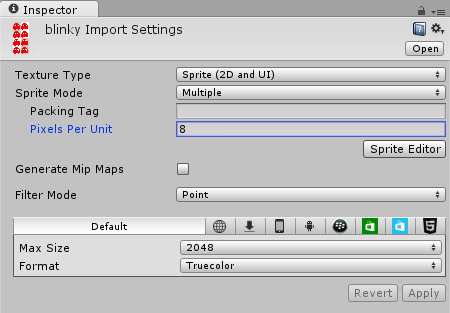 Once the Sprite was sliced, we can close the Sprite Editor again. If Unity asks us about Unapplied Import Settings then we will click on Apply. 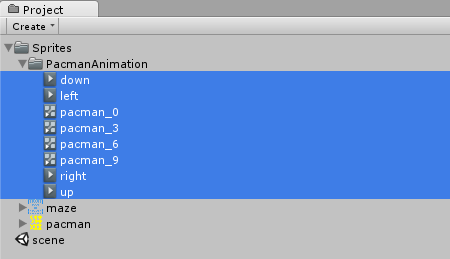 The first file is the animation state machine that specifies things like the animation speed and blend trees. The second one is the animation itself. We will repeat this process for the rest of the animations (Slice 3, 4, 5 for left; Slice 6, 7, 8 for up and Slice 9, 10, 11 for down). 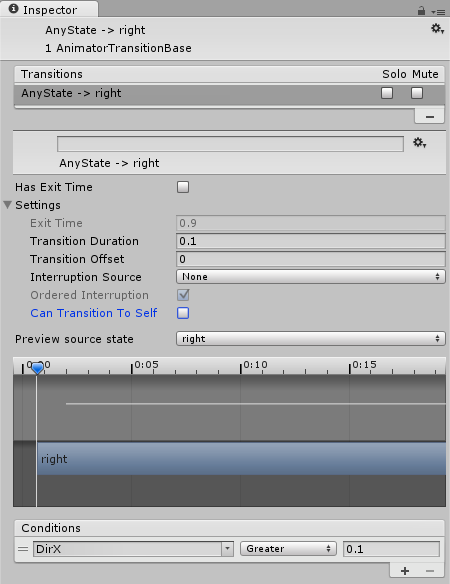 We will also add Transitions so Unity knows when to switch from one animation state to another. 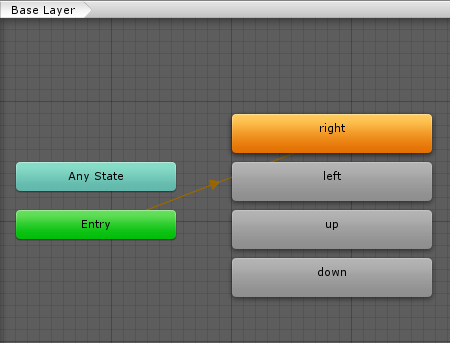 Note: Unity will play the right animation over and over again while in right state. It will use Transitions to know when to switch to another state. 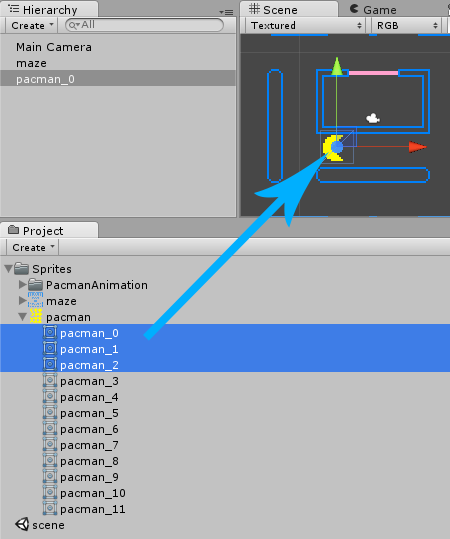 Unity does all of that automatically, all we have to do is notify it about Pac-Man's movement direction from within a Script later on. 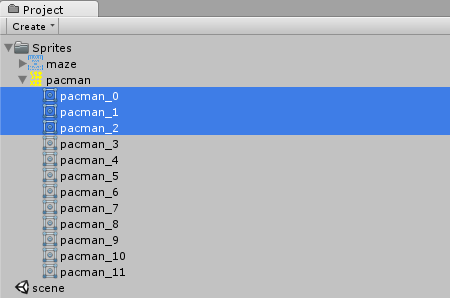 The big deal about Mecanim is that it will take care of the animation states on its own, fully automatically. All we have to do is tell Mecanim to watch out for our Pac-Man's movement direction, nothing more. 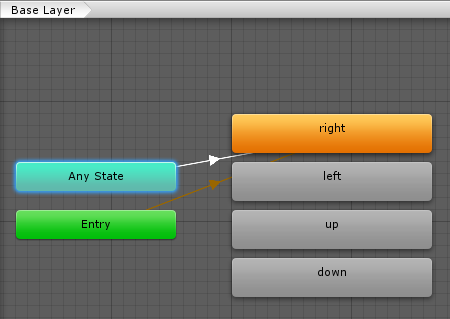 Mecanim will then switch between animation states on its own, without us having to do anything. 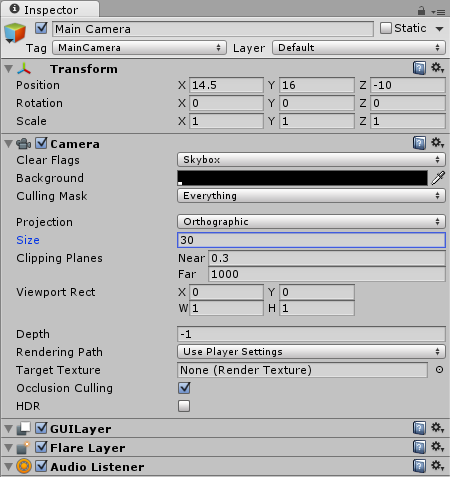 We want Unity to automatically switch to different animation states based on those parameters. Transitions are used to achieve just that. 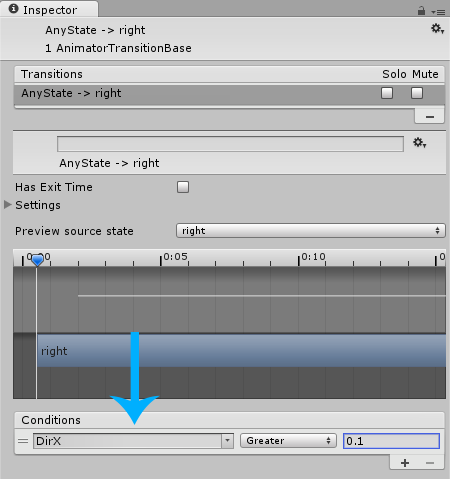 For example, we could add a Transition from left to right with the Condition that DirX > 0. However it's considered best practice to have a small error tolerance because floating point comparison is not always perfect, hence why we will use DirX > 0.1 instead. Now we would also have to use a DirX > 0.1 Transition from every other state to right. 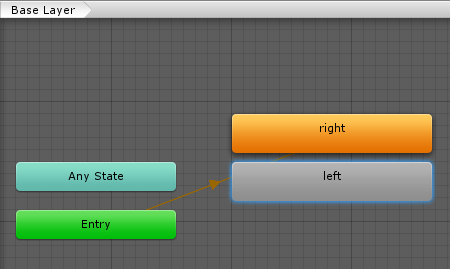 To save us from doing all this work, we can use Unity's Any State. The Any State stands for literally any state. So if we create a Transition from Any State to right then it's the same as creating a Transition from left, up and down to right. Note: press the + at the bottom right to add a Condition. Note: this avoids weird situations where an animation would be restarted all the time while holding down a movement key. As result, whenever Pac-Man walks to the right (DirX > 0.1), the animator will switch to the right state and play the animation. Right now Pac-Man is only an image, nothing more. He is not part of the physics world, things won't collide with him and he can't move or anything else. We will need to add a Collider to make him part of the physics world, which means that things will collide with Pac-Man instead of walking right through him. Pac-Man is also supposed to move around. A Rigidbody takes care of stuff like gravity, velocity and other forces that make things move. As a rule of thumb, everything in the physics world that is supposed to move around needs a Rigidbody. Alright, Pac-Man is now part of the physics world. He will collide with other things and other things will collide with him. This will also cause the OnCollisionEnter2D function to be called in any Script that is attached to Pac-Man. Alright now there are several ways to make Pac-Man move. 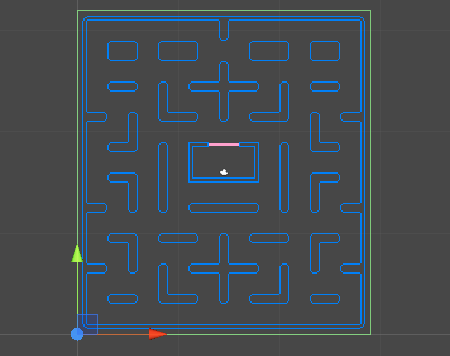 The easiest way would be to create a Script that simply checks for Arrow-Key presses and then move Pac-Man a bit up/down/left/right when needed. This would work, but it wouldn't feel very good. Instead we will try to be more exact. 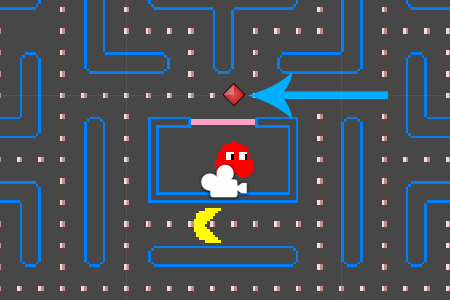 Whenever the player presses one of the Arrow-Keys, Pac-Man should move exactly 1 unit into the desired direction. 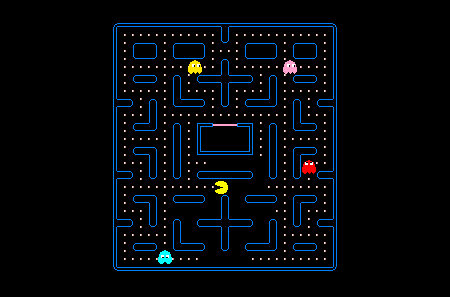 The Pac-Dots (the food) will also be positioned with a 1 unit distance between them, so it only makes sense that Pac-Man always moves exactly one unit. 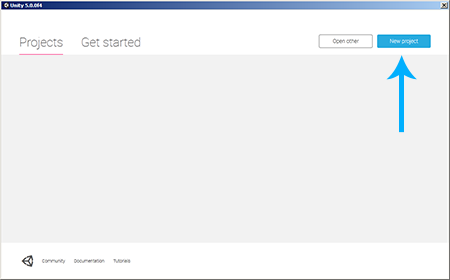 The Start function is automatically called by Unity when starting the game. The Update function is automatically called over and over again, roughly 60 times per second (this depends on the current frame rate, it can be lower if there are a lot of things on the screen). We will also need a way to find out if Pac-Man can move into a certain direction or if there is a wall. So for example if we would want to find out if there is a wall at the top of Pac-Man, we could simply cast a Line from one unit above of Pac-Man to Pac-Man and see if it hit anything. If it hit Pac-Man himself then there was nothing in-between, otherwise there must have been a wall. Note: we simply casted the Line from the point next to Pac-Man (pos + dir) to Pac-Man himself (pos). 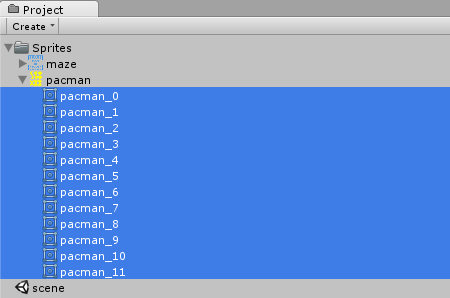 Note: we used GetComponent to access Pac-Man's Rigidbody component. 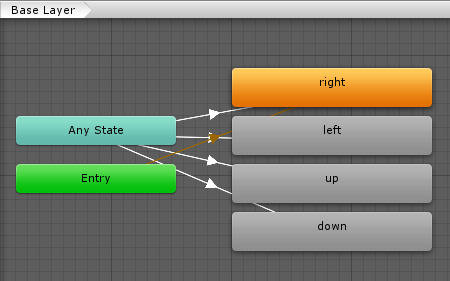 We then use it to do the movement (we should never use transform.position to move GameObjects that have Rigidbodies). Let's also watch out for arrow key presses whenever we are not moving. Note: we are not moving if the current position equals the destination. 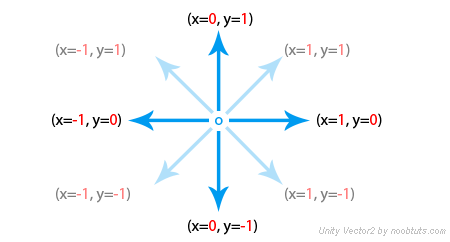 Note: transform.position is casted to Vector2 because this is the only way to compare or add another Vector2. Also -Vector2.right means left and -Vector2.up means down. Note: we calculated the current movement direction with basic vector math. All we had to do was subtract the current position from the destination. Before we start to work on the Pac-Dots, we should make sure that Pac-Man is always drawn in front of them. We are making a 2D game, so there isn't really any Z order like in 3D games. 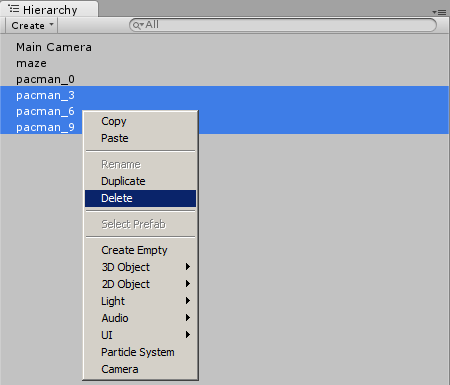 This means that Unity just draws objects as it pleases. 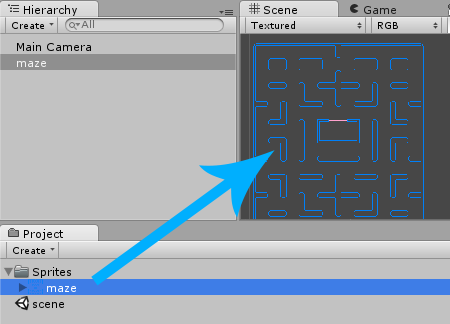 Let's make sure that Unity always draws Pac-Man in front of everything else. 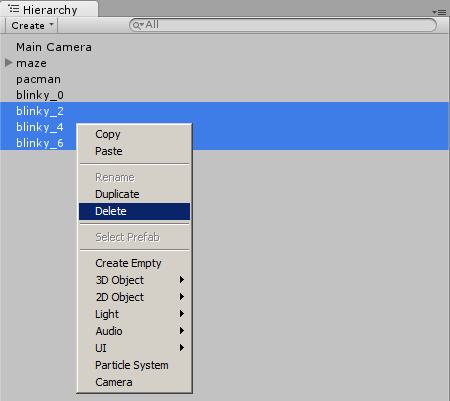 Note: Unity draws objects sorted by their order. It starts with the lowest order and continues with higher orders. So if Pac-Man has the order 1 then he's always drawn after the maze and the food and anything else with order 0. And because he's drawn after everything else, he's automatically in front of everything else. 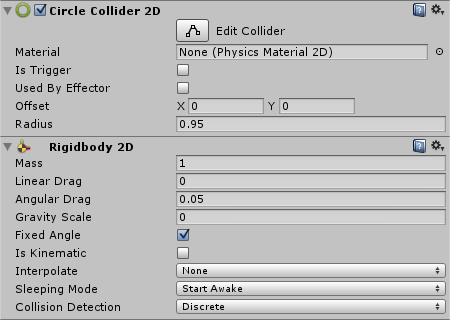 Note: a Collider with IsTrigger enabled only receives collision information, it does not physically collide with other things. 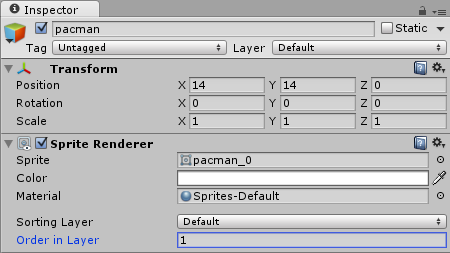 Unity will automatically call the OnTriggerEnter2D function whenever Pac-Man or one of the Ghosts walk over the Pac-Dot. Note: if we wanted to implement a highscore in our game, then this would be the place to increase it. 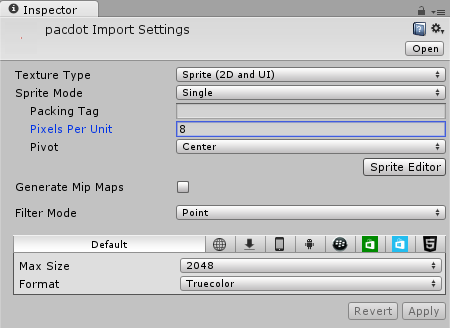 Now we can right click the Pac-Dot in the Hierarchy, select Duplicate and move it to the next free position. It's important that we always position the Pac-Dots at rounded coordinates like (1, 2) and never (1.003, 2.05). 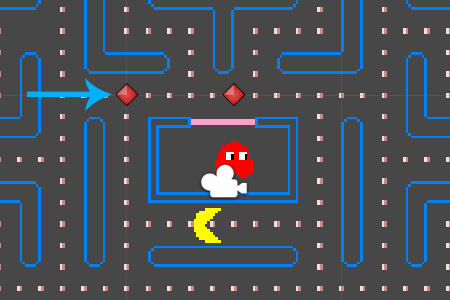 A good Pac-Man clone needs some enemies, so let's add a few ghosts. 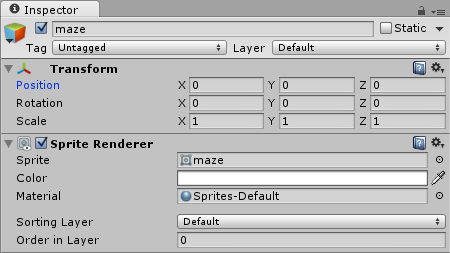 Afterwards we can close the Sprite Editor and press Apply. 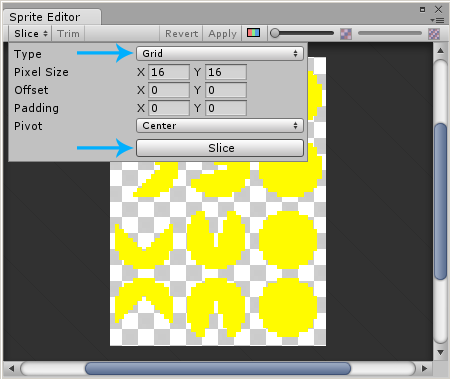 Now it's time to create the animations by dragging the slices into the Scene, just like we did with Pac-Man. 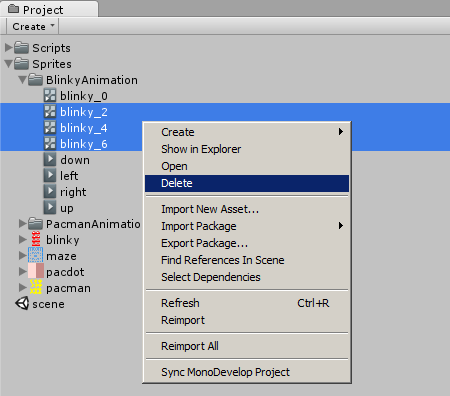 At first we will drag Slice 0 and 1 into the Scene and save the animation as right.anim in a new BlinkyAnimation folder. Note: we enabled Is Trigger because Blinky is a ghost, and ghosts can walk right through things. Alright so we don't know very much about how the AI works in the original Pac-Man game, except for the fact that it's deterministic (which is a fancy word for not-random). It also appears as some ghosts are more focused on moving around the maze, while others are more focused on following Pac-Man, or perhaps even trying to position themselves in front of him. In this Tutorial we will focus on the easiest of the AI options: moving around the maze. 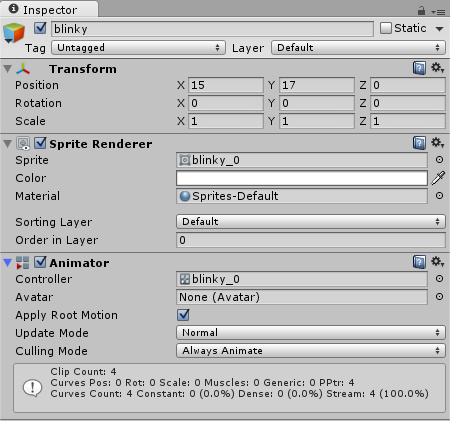 We will create a waypoint movement Script that makes Blinky run along a certain path. What sounds almost too simple is actually a pretty decent solution to our AI problem. The longer and the more complex the path, the harder it is for the player to evade Blinky. Note: an array means that it's more than just one Transform. Note: the current waypoint can always be accessed with waypoints[cur]. Note: we used the Vector2.MoveTowards function to calculate a point that is a bit closer to the waypoint. 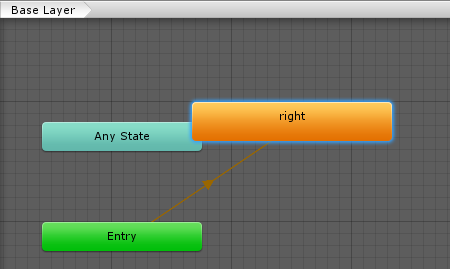 Afterwards we set the ghost's position with rigidbody2D.MovePosition. If the waypoint is reached then we increase the cur variable by one. We also want to reset the cur to 0 if it exceeds the list length. We could use something like if (cur == waypoints.Length) cur = 0, but using the modulo (%) operator makes this look a bit more elegant. Note: feel free to decrease Pac-Man's lives or show a Game Over screen at this point. Note: a Gizmo is just a visual helper, we don't see it when playing the game. And because our Movement Script will automatically continue to walk to the first waypoint after the last one was reached, we will have a perfect loop. Note: it's important that we use different waypoints and movement speeds for each ghost in order to make the game more challenging. 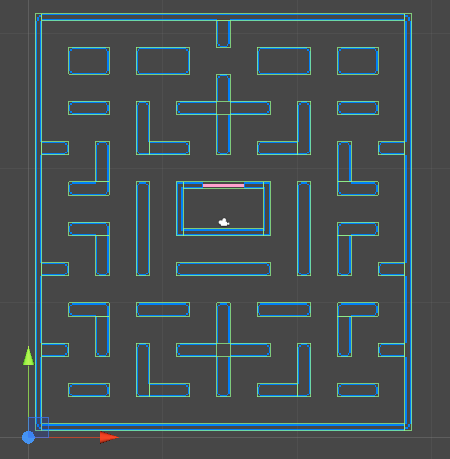 We just created a very solid, fast and simple 2D Pac-Man clone in Unity. We learned about Pixels to Units, Mecanim, Colliders, Rigidbodies, Layer Orders and Scripting. And even though the AI is very simple and deterministic, the game is still very challenging. 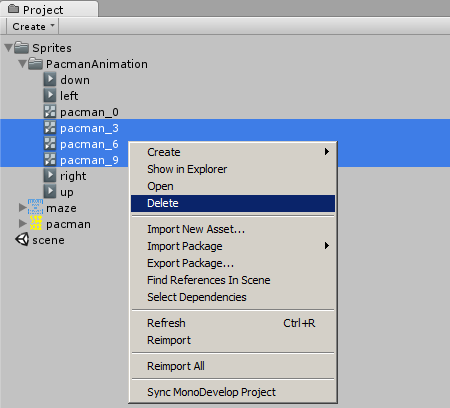 The Unity 2D Pac-Man Tutorial source code & project files can be downloaded by Premium members.